Pagination is the practice of dividing a piece of content into different pages and it heavily affects User experience, Web Development and SEO. It is a commonly used navigation technique with both pros and cons. This article is the 1st part of the SEO Pagination Guide and we will discuss the most common types of Pagination that one could find on the web and we will list the benefits and the side effects of using pagination. The Paginated Lists: This type of pagination is used when we split a large list into several pages. This is a very common navigation technique that we find on Ecommerce websites, where the product lists are usually divided in different pages, primarily because they are too large to display all at once. The Paginated Content: In this case a particular piece of content or article is segmented into several different pages or parts. This type of pagination is less common compared to the first one, but it is used by many high traffic websites and primarily by News portals. 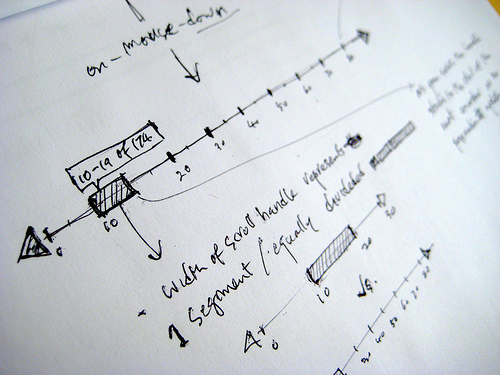 There are several reasons why pagination is essential in some cases. First of all when we have a large list of products, articles etc, it makes sense not to display all of the entries all at once. By providing smaller chunks of info to the user, you help him read the page easier, you can ensure that he will focus on the important parts of the page (such as the call to actions) and you reduce scrolling. Other reasons why you want to segment the information is because it reduces the server load. 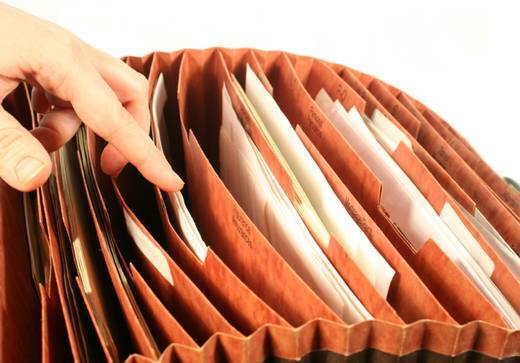 It is faster to get from your database the 10-50 products from one category than retrieving all products at once. Also the fewer the elements that are presented on a page, the faster the page loads; this can heavily affect user experience. Finally there is a pretty good reason why News websites tend to split not only the lists of articles but also the articles themselves. By splitting the articles into different pages you can increase the number of pageviews per user and the total pageviews of the website. Since most News websites sell advertising space they want to maximize the number of impressions that they can serve and the number of Advertising units that they can sell. Both of them can be achieved by splitting their content into different pages. Despite the positive effects of pagination, there are several very important reasons why someone should avoid it. First of all over-segmentation will force the user into clicking several times to land on the page of his choice. Moreover the total time that he requires to fetch all the information will increase (even though the individual pages will load faster). 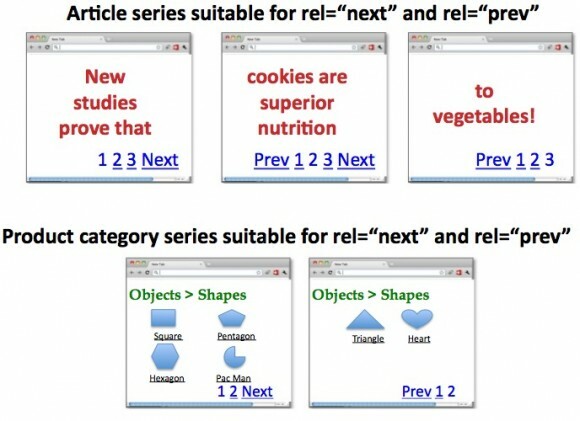 Finally one should note that there is a trend for “more scrolling – less pagination” since many popular services such as Google Image Search, Facebook and Twitter now use alternative techniques (AJAX) to load automatically additional content as the user scrolls down the page. Experienced programmers, database specialists and ITs know that the benefits of pagination on server load reduce as the user goes deeper into the list of the results. In some cases, particular pagination implementations that display the total number of results can even increase server load! (If you don’t understand this it’s OK, if you understand it you are a fellow-perfomance-geek! :p ). 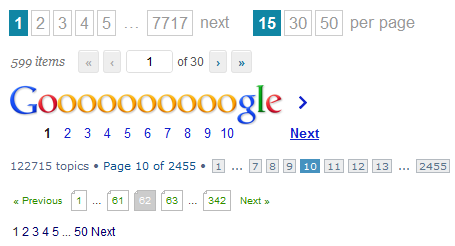 Pagination causes massive problems on SEO. As most of you know, the pages that are several “clicks” (steps) away from Homepage tend to receive less Link Juice (PageRank) and they are more difficult to be crawled & indexed by the search engines. Moreover pagination & filtering features are notorious for causing massive duplicate content issues and for messing up with the link architecture. In addition to the above, Pagination leads to splitting the total number of links, anchor text, PageRank and Social Media shares that a page would get if it was not segmented and thus it can severely affect the rankings (we will see techniques on the next article to resolve this). Finally you might find that some of the internal pages of the series rank on SERPs pages. Usually you would expect the user to land on the “first page” of the page series and not in the middle. If those landing pages are not as relevant for the queries of the users, they will affect the CTR or the Bounce Rate of the website. Pagination is sometimes necessary, but it should be used with caution. In several cases it can be avoided by modifying the internal linking structure of your website and by segmenting your content in more specialized categories. This technique is by far more effective for indexing and SEO, since it reduces the distance of the segmented pages from homepage and the “clicks” that are required in order to land on a particular page. In other cases though pagination can’t be avoided and thus careful development and more advanced techniques are required to resolve the problems that it causes. On the upcoming blog posts we will examine in detail the effects of pagination in SEO and we will present the available methods and techniques to resolve the various SEO problems that popup. Then we will present a real life scenario, where we will use the available methods and we will explain how you should find the best implementation that matches your needs.